Delivering constant illumination, LED panels have their uses for photography, but you need to choose one carefully. Here we've rounded up 6 of the best LED panels for photographers to see which offers the best value for money. As light sources, arrays of high-efficiency LED panels have found favour in everything from torches that you can wear on your head to low-energy lights for homes, offices and shops. LED panels also have advantages over flashguns for photographic use. Instead of a bright but very short pulse of light they deliver constant output, which makes it easier to view lighting effects while composing a shot. 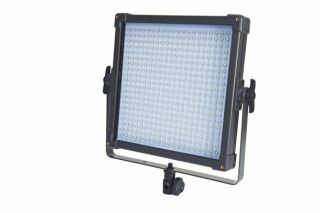 The down side is that the maximum output of LED panels is typically much less powerful than that of a flashgun, so you'll often find you need to place an LED panel very close to what you're shooting. Constant lighting is essential for video shooting. LED panels can be effective for this, but be wary of models which give a flickering output, especially when the power setting is reduced. None of the LED panels in this test group exhibit flickering. To test the maximum output of competing panels, we used a Sekonic Litemaster Pro L478DR in incident metering mode, placed at a distance of one metre from each panel in turn. The aperture for a correct exposure was measured in the dark at ISO200 and a shutter speed of 1/60th of a second. Despite being the second cheapest panel in the group, the Matinee boasts a fairly sizeable active surface area of 25x8cm. It's still lightweight enough to be mounted in a hotshoe, and a mini ball head for this or tripod fitment is supplied. A mains power pack is also included. Alternatively, you can run the panel from a Li-ion camera-style battery, which can be bought separately complete with mains charger. The maximum claimed output of 1900 Lux is impressive for a panel of this size, and dual-colour LEDs enable you to vary the colour temperature between 3200-5600K. Adjustments for this as well as output power are easily made using the two rotary knobs. In our tests, the maximum power in operation equated to a lens aperture of f/3.6. Pros Fairly powerful yet light; variable colour temperature. Cons Can't be powered from regular AA batteries. We say Large enough for soft lighting, and unbeatable value. Additional options include a mains adaptor, which is available for separate purchase. Unlike the Interfit Matinee, the Kaiser StarCluster's colour temperature is fixed to a daylight value of 5600K, although both a diffuser panel and a tungsten filter, which attach magnetically, are supplied with the panel. Rated at 600 Lux, the panel enabled an aperture of f/3.2 in our one-metre test, but only f/2.8 when the tungsten filter was fitted. Power adjustment is smooth and overall build quality feels good for a lightweight unit. Pros Small but robust; diffuser and tungsten filter included. Cons Shame the external battery option is Canon-based. We say A good buy, although it only has daylight-balanced LEDs. Building on Manfrotto's success with small, portable light panels, this new model is a little larger than earlier ones, at 15x10cm. Rated at 540 Lux, it runs on six AA batteries and an optional mains adaptor is also available. Dual controls enable output power adjustments and a colour temperature range of 3200-5800K. As with the Interfit Matinee, a mini ball head forms part of the kit, making the panel suitable for hotshoe mounting or fitment on a tripod head. Despite the maximum claimed output rating being substantially lower than for the Interfit panel, the resulting aperture required in our one-metre test was f/2.8, not much wider than the Interfit's f/3.6. However, the output dropped a little when we tested it using only the tungsten colour lamps, requiring an aperture of f/2.2. Pros Simple controls; portable; takes standard AA batteries. Cons More than twice the price of the Interfit Matinee. We say It's convenient, but pricy for a relatively small panel. Although sold as a small panel in its own right, this particular panel is also often sold as part of a much larger system which enables full studio lighting setups based on LED panels. Typical of the Rosco range, it has an industrial level of build quality, complete with a steel and aluminium housing designed to withstand lots of punishment. A fine grid of relatively tiny LEDs makes for a very smooth light source but, bought as a standalone panel, the LitePad Axiom lacks dual colour temperatures or even a dimmer adjustment. On the plus side, a convenient slot enables fitment of wide-ranging filters and diffusers. Around the back, a universal mounting system keeps your options open. In our lab tests, this panel's output power proved the lowest in the group, equating to a required aperture of f/2. Pros Fully professional build quality; grid of ultra-small LEDs. Cons No power adjustment; the strength of illumination is low. We say Very well made, but not ideal as a standalone panel. Much larger and weightier than hotshoe mounting panels, this one has an active surface area of 30x30cm and mounts on a regular lighting stand. It's powered by a clip-on mains adaptor (which is supplied with the panel) though you can fit an optional battery pack in its place if you prefer. As one of F&V's 'bi-colour' panels, the colour temperature is variable between 3200-5600K, via a rotary knob on the rear, which is positioned next to the power adjustment knob. The panel is rated at 2490 Lux and, in our tests, enabled an aperture of f/4 at a distance of one metre, using both daylight and tungsten colour temperatures. It's therefore not much more powerful in practical terms than some of the relatively small panels - including the Interfit Matinee, which sells for less than half the price. Pros Good build quality; mains powered or battery pack. Cons Despite its size and power rating, output is disappointing. We say The price is competitive for such a large panel. With a similar size and build to the F&V LED panel, the Limelite also gives you the ability to connect multiple panels together via ethernet cables for synchronised control. Again, it's mains-powered and you can purchase optional battery packs, but the Limelite also has pushbutton controls with an alpha-numeric display, enabling precise and easily repeatable adjustments. The panel is available in daylight or tungsten colour temperature (we tested the Daylight version), while a pricier 'bi-colour' option costs £835/$1120. The biggest difference between this and the F&V is in maximum power output, the Limelite being rated at 4200 Lux. In our one-metre test, it enabled an aperture of f/9, proving that it's a lot more powerful than any of the other panels in the group. Pros Rugged metal frame; pro features; powerful output. Cons Expensive, especially if you go for the bi-colour panel. We say A gem, with advanced features and mighty power.